The USDA is crystal clear: It’s illegal to sell poultry in the U.S. raised with added hormones. 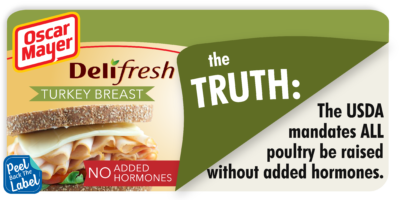 But that hasn’t stopped Oscar Mayer from advertising their DeliFresh turkey as having “No Added Hormones”. They even acknowledge the label is meaningless by putting the disclaimer “Federal regulations prohibit the use of hormones” right below the nonsense claim. Their hope? That consumers will skip the fine print. So why does Oscar Mayer plaster their packaging with a label they know is misleading? Because “added hormones” sounds scary. An absence claim makes the Oscar Mayer product appear safer and healthier than the competition’s. Talk about a load of bologna! No matter what the scare marketers at Oscar Mayer want you to think, the truth is that turkey NEVER has any added hormone – ever. It’s the law. Oscar Mayer‘s brazen disregard for common sense and clear disrespect for consumer intelligence earn them a special place in the food labeling Hall of Shame. It’s time for Oscar Mayer to stop stoking consumer fears and steer the Weinermobile down the path of truth and transparency. Show Oscar Mayer that you won’t stand for their deceptive labeling by tweeting, posting to their Facebook or writing a message to them today.